Lately I have been going to the homes of new clients and doing my normal walk-through. I love this time because I get to know my clients inside and out. Sadly, comments I have been hearing quite often are “Well, I’m not sure if this is right” or “I am not sure if this is organized correctly”. It has caused me to take pause in my career and ask WHY someone would not know if what they had done was ‘RIGHT’ or ‘CORRECT’. Where does this come from? How could they not know? I believe that people in our society, especially WOMEN are being pressured to ‘De-Clutter’ and ‘Organize’. Standards are set high. Just walk down the isle of any store at checkout, and look at all of the magazine covers. Rarely will you see one that does not pressure one to be Organized or De-Cluttered, once and for all!! In addition, many stores carry organizing tools and supplies to help us. Of course at the very same time we are also being pressured to CONSUME and provide for our family constantly. We are also being pressured to multi-task ever more than at any time in our society. We must be super-mom, super-wife, soccer mom, (baseball mom, swim mom, basketball mom, etc. ), feed our family (in the most healthy way possible), be involved in our children’s school, (PTA), volunteer on committees, attend events, entertain, keep our house clean and running like a well oiled machine, be a taxi, PLUS, work a job outside the home, keep slim and sneak a work out it, keep a smile on our face, AND be ORGANIZED in it all! —and not just ‘ORGANIZED’- But REALLY ORGANIZED. Perfectly ORGANIZED- ‘ONCE AND FOR ALL’. No wonder why many of my clients fee pressure! In my personal experience, I am here to tell you, that unless you live alone, make a lot of money, and either can afford to have help, or have a lot of free time, this is not realistic. If your life sounds like the one I described above, here are some guidelines to use in your home to decide if you are organized ‘enough’. Yes, I am giving your permission to not be perfect. 1. Do you know where everything is? (it may not look pretty, but you know where it is?) – if so, then you are organized. 2. Does the system you established work for you, and each member of your family? 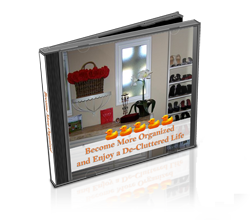 (it may not look like ‘Better Homes and Gardens’, but it works)- if so, then your are organized. Because these days, sometimes, this is the best you can do. Today, let that be good enough. I just let out the biggest “exhale” !!! Thank you Missy !! !That was priceless learning tool for today !!! No “perfect” organizing. Perfection”ism” is rampid ~ huge here in Orange County!! !